Drink: Here’s more good news for fans of food and drink. Alcohol is also very wallet-friendly here. All draft pours of local beer cost about 60 cents throughout the country. Bottled local beer will be about $1, possibly less depending on where you are. Bottles of local whiskey can be bought for $5-$10 at bars –or you can get them at $5 or less on the shelves of a store. Ground Transportation: Buses are by far the least expensive way to get around the country, although the most time consuming. You can get a one-way ticket for the eight- to 10-hour overnight ride between Yangon and Inle Lake for $20-$30. Air Travel: Don’t expect to find regional budget carrier AirAsia-type value when flying within Myanmar, especially within the tourist circuit of Yangon, Inle Lake, Mandalay, and Bagan. On the country’s cheapest airline, Golden Myanmar, a domestic flight of two hours and 15 minutes from Heho (Inle Lake) to Yangon can be $86 one-way. For a funny comparison, an international flight that’s about a half hour longer from Yangon to Bangkok is $42. Entrance Fees: Myanmar is no dummy when it comes to distinguishing which places tourists want to see, specifically the Buddhist shrines. In Yangon, for example, entrance to the Shwedagon Pagoda costs $8, while fees to Bagan is now $15 (up from $10 back in 2013). In addition, tourists pay a higher price than locals for the same experiences. To be fair, that’s true in many other parts of Southeast Asia — and we still think that the attractions and their beauty are worth seeing. We’re just letting you in on the fact that, yes, entry fees are equivalent to five to ten meals, but they won’t cost you an arm and a leg. Lodging: Similarly, budget travelers will be surprised to find that hostels and hotels in Myanmar aren’t really all that cheap compared to the rest of Southeast Asia. Mid-range hotels in the center of Yangon will approach if not exceed $100 per night, and private rooms in hostels or guesthouses are closer to $40 if you’re looking for amenities like air conditioning. That’s just about double compared some other tourist-heavy destinations in the region like Hanoi. But, again, we’ll say that $40-$100 per night for accommodations is perfectly manageable for most travelers — and most visitors agree that the lush landscapes, delicious eats, and seeing a country in transition makes for a great experience. 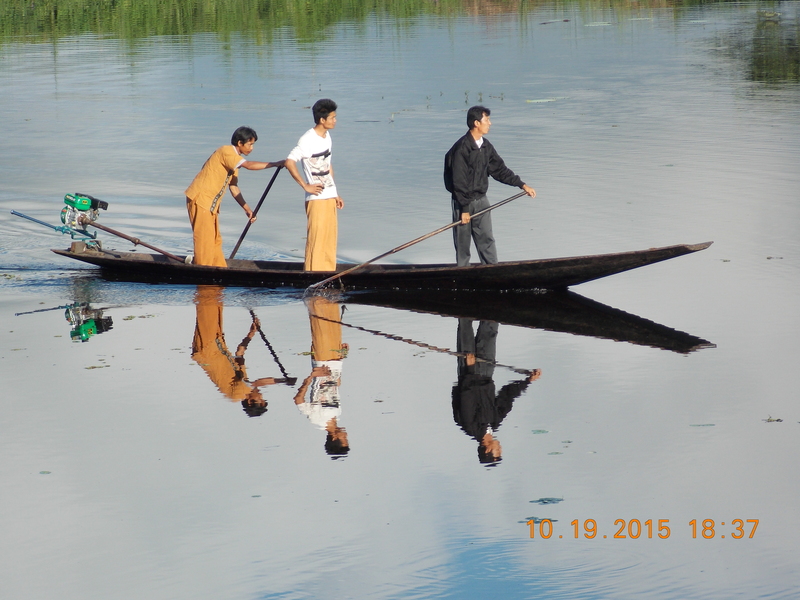 Got up at 5am this morning (Monday), caught an 820 flight to Heho, the gateway to Inle Lake. We have been seeing roughly the same tourists on this itinerary, though the hotel may differ. Delightful as they may be, what is the point of talking to other Americans or Europa types when in Burma? Anyway, we took an hour shuttle van, then about 45 minutes on a long tail boat to get here to a very nice resort. Even the beer is cold, despite its rather touristy atmosphere. Worse yet, we are trapped here with nowhere to walk! The area seems quite rich in terms of farming, though the homes and villages are quite simple, save for the plantation owner. Lots of motobikes and putt putts, with a few bicycles for good measure. But strangely, little bird life. Definitely not our kind of place. We did meet some Americans on a photo journey, but lost them at the airport. They were delightful, though a little taken with the size of their cameras. I think one or two are famous, even. They were rather jealous when I told them about an Hawaiian island chamber of commerce wanting to use an old photo of mine. Tomorrow, we get to head out to some schools and villages on the lake. We need to get rid of a huge bag of hotel toiletries, and all of the school supplies we brought for the kids. I did find one cute little girl, tagging along with mom who was gardening outside of Mike’s bungalow. She was quite shy until her mother gave her the okay to accept my gifts. These are bungalows, with huge king beds, double twin sitting area, outside patio deck, full bath, work desk, fan, and part time AC. Periodically, the power goes out until the generator kicks in. They spent a fortune getting this place to look like a typical lakeside village. And we had mosquito nets over the bed for safe measure. It seems there are very few guests here this time of year. But tomorrow (today) is a famous ceremonial Phaung Daw Do, in which four golden Buddha images are ferried around the lake in a royal barge. This goes on for 3 weeks, followed by Thadingyut, when the Intha and Shan people dress in new clothes, and celebrate the end of Wassho (Buddhist Lent). This is so important that many families spend their entire, meager savings during this annual event. I have concluded that their inner peace and happiness is based on their devotion to Buddhism. They endure not only a military dictatorship, but annual floods, poor working conditions, and obnoxious tourists! I love the nicely dressed ladies sitting side saddle on a creaky and dusty motobike. BTW, the Chinese moto costs $500, but the Japanese moto, usually a Honda, costs $2000! I say make the most of this stay, despite the high end resort feel that we get here. 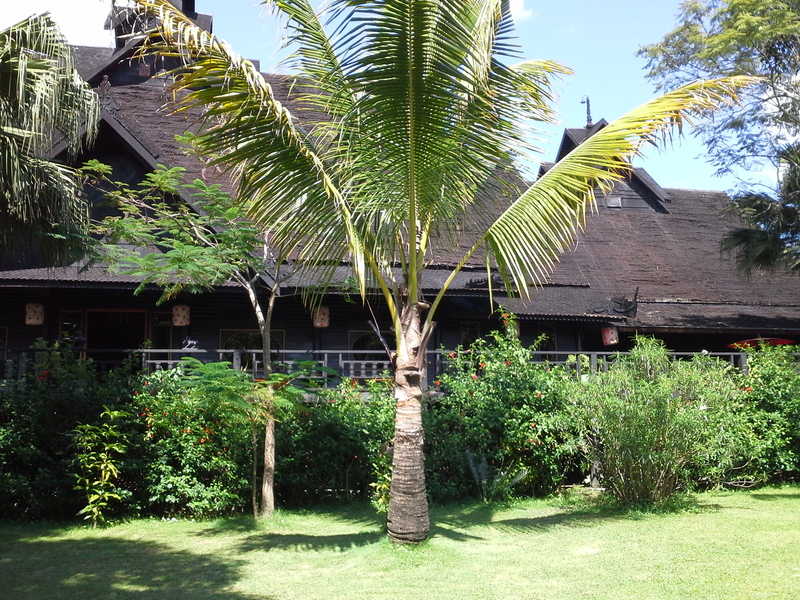 The staff is so very nice, and the food seems good, though hardly on a level with Rangoon. But the beer is cold, and the service is wonderful. We head back to Bangkok tomorrow, via Rangoon. Home, sweet home on the horizon. And we have seen the famous one legged method of rowing. 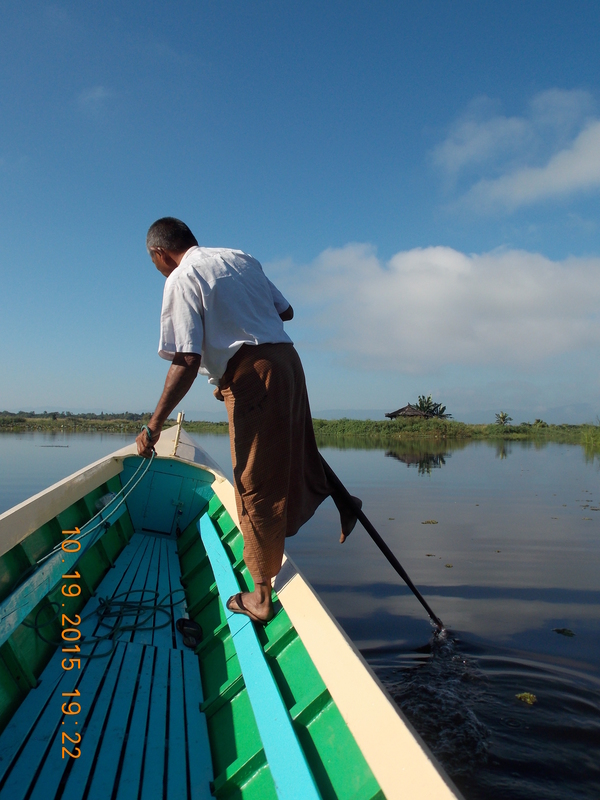 As our motorized boat neared our resort, a young man hopped on with a long slender wooden oar. He stood on his left leg, wrapped his right leg around the oar, and propelled us (me, Mike, and the boat owner) another 150 yards to the resort dock. And his hands were at his side, nothing holding him to the boat!